In September 2005 we vacationed in Liguria, in a beautiful town called Diano San Pietro. This picturesque town lies between Imperia and Genoa. While visiting an organic food market in Imperia I made acquaintance with a charming Italian mamma who was selling, among other Ligurian delicacies, jars of Pesto alla Genovese. She seemed to be completely charmed with Soeren and we started talking. I dared to ask her, her recipe for the pesto. She told me the story first. 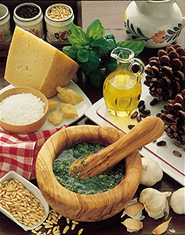 Pesto was invariably made by hand using a mortar and pestle. The name comes from the act of using the pestle. This is still the classic and preferred method for the Ligurians and probably most Italians, but modern times have even reached certain kitchens in Liguria. It is now a given that much of the pesto made today is made in a blender. She told me that handmade pesto is certainly better because the ingredients have been worked less, but blender pesto is fine as long as you use the finest, freshest ingredients available. This pesto may be tossed with spaghetti, maccheroni, linguine, or the classic Ligurian pastas, trofie or trenette. Place a few leaves of basil in a mortar. Add a clove of garlic and crush the leaves and garlic in the mortar using the pestle. Add a few more leaves of basil and another garlic clove, and repeat the process. Once you have crushed all of the basil and garlic, add the pine nuts. Crush until the basil, garlic, and pine nuts are well blended. Add a tablespoon of olive oil and combine with the ingredients in the mortar. Then add the Pecorino Romano a little at a time, stirring with a wooden spoon. Then stir in some more oil, a tablespoon at a time. The idea is to have a thick, creamy sauce. Place all of the ingredients in a blender. Blend at high speed for a minute. Lift the lid carefully, and scrape the sides of the blender cup using a rubber spatula. Check the consistency of the pesto, which should be thick and creamy. Blend for a few more seconds if you think the pesto should be a bit thinner, but don't overdo it. Your blog is cool and pictures are very good... I have few questions with regard to three sauces from your blog. what is the shelf life of these sauces that we prepare at home... i prepared Pesto alla Genovese today, and i am leaving on a vacation for 10 days, i am wondering about its keep. BTW How about the shelf life of these two Arrabiata Sauce, and Aglio Olio. Preparation had my whole kitchen spread with basil... and thanks for sharing this wonderful recipe. They came out perfect and i love the taste and "nice" aroma of pesto..
i did add couple of green chillies for extra spice kick (in one batch)... Wonderful recipe, thanks for sharing them!!! chooo sweet of you (like soeri)!! !